Today, 2010, was the day we turned the website on, put out the shopping cart and officially opened for biz. 🙂 What a scary thing to do but also exhilarating! What if no one came? What if the site breaks down? What if what if what if what if…. that is about all you hear in your mind as you open up shop with such high hopes. Since this is our one year mark and I guess I like to reminisce I wanted to give a lil past, present and future for us as we go into year two. You thought I was going to show you something that looked like Kaylee huh? LOL! Nope, these were the first thoughts…someone said they looked like the Mii’s from the Wii, which me never having a Wii (just got one at Chrimbo this year!) was like the what?? I was never quite happy with this entirely so I went back to the drawing board. I looked around at a lot of different styles and what I liked. It was a long while it seemed before I was finally satisfied with something enough to show it to my hubby and pitch him the whole crazy idea. While I might be able to draw it, he has always been my go to guy to put my crazy ideas into action. Poor hubs! The saying “dream it, do it” has always been part one me, part two him 🙂 So the first Kaylee was born! I didn’t have copics then and you can tell I had alot to learn about coloring! Still do 🙂 We opened up shop on Jan 18th with 35 digis that were Kaylees, Kodys, Critters and Confections. I’m not even sure how many we have now but I’m sure its gotta be more than 35 🙂 I took on my first DT in March last year (Kimmy, Marcie and Robin were all on the first team, putting up wit my newbie-ness) and have been plugging along since. Kaylee has gained a new friend, Mae, and everyone has updated their looks a bit. The site has had 3 makeovers, I’m purty happy with this one even though I still see some room for improvement 🙂 (poor hubs!) . The future for Some Odd Girl? Or SOG as Leah and I started affectionately calling it sometime ago and has spread lmao! Still makes me laugh! Anyways, 2011 is going to be bringing a few things to the preverbial table. Most notably we will be going physical! Photopolymer Acrylic stamps to be precise 🙂 You can see in Robin McKinleys post HERE her take on one of the samples I received from the manufacturer. The 4 girls, with me since the beginning, each got one to give me their opinions on. We are hoping to have it ready to go in the next couple months! SO exciting! Each one will be a single with a coordinating sentiment, totally ready to go card making! Also the name, if you’ve noticed on our Facebook, Some Odd Girl Stamps and Designs will finally be fufilled when the design site, www.someoddgirldesigns , gets up and running hopefully in the next few weeks 🙂 This site won’t have stamps but other handmade goods for sale. I’ve been busy makin stuff for it so I hope you’ll check back! Are you excited? I am! The Odd Girls are! 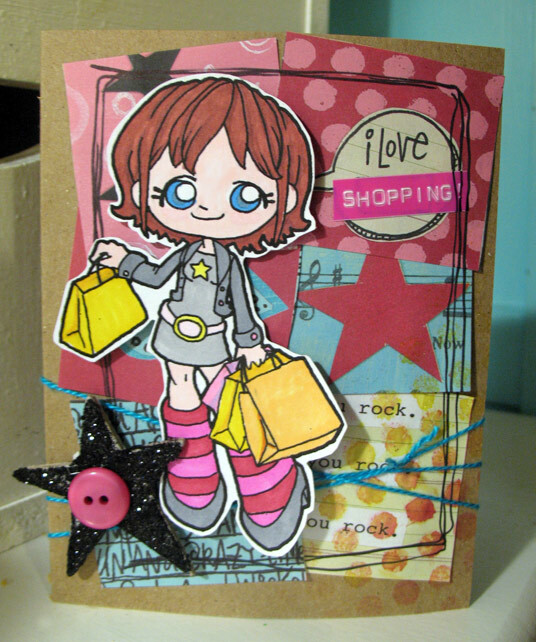 To close up today we have a mini blog hop for you 🙂 Each of the Odd Girls has posted their favorite Some Odd Girl Cards they’ve made during their terms, some are longer terms than others lol! So hop thru the list and see what’s in store. I don’t even know what we’ll find! Thanks so sticking around for the long read 🙂 Like I said, I like to reminisce. This time and this company have become my world and I’m so glad I’m getting to share it with so many wonderful, supportive, people! Next Post: Anniversary Week Challenge – Color Pride! Happy Anniversary! Love the first image you did. Happy ODD Anniversary!! Have been a long time follower and lover of all the Oddities that come from kristy's genius mind! Cant wait to see what 2011 brings!! Congrats!! Happy Happy Birthday!! And congratulations on such a successful and FUN little business!! It's such a blessing!! Love you guys, and all the SOGgy images! WHOO HOO, have another amazing year!! Happy Anniversary!! !What an amazing year this most have been…Looking forward to tne next!!! Awesome ramblings Kristy! I LOVED the read! TFS. And your first sketch (the serious one) is WONDERFUL!! Throw a couple of these in the store & they'd sell like wild fire! Happy Anniversary! Happy Aniversary! What a lovely journey through each of the blogs! And to enjoy all the beautiful creations! Real eye-candy! What a great story. And what great friends you have. Congrats on your First Anniversary. Congrats! I saw so many great projects on the hop and some digis that I'm going to have to buy!